Continue driving up School Street, keeping to the left where the road splits, and following it to the crest of the hill and the junction with Schoolhouse Lane (just before the Dead End sign). Turn right onto Schoolhouse Lane, and drive down that short, steep hill to the junction of Church Street. Park on the street or in the Episcopal church lot. 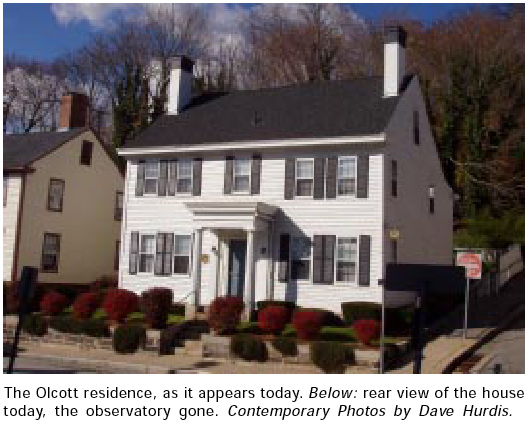 Looking back at the white building (#62) on the corner of Church Street and Schoolhouse Lane (just opposite the Episcopal Church) is the onetime home of William Tyler Olcott, an attorney, and amateur astronomer. Photos below from AAVSO’s website. He distinguished himself as one of the founders of the American Association of Variable Star Observers (AAVSO), and was the author of a number of books on the subject. For a time his home served as the unofficial office of that organization. 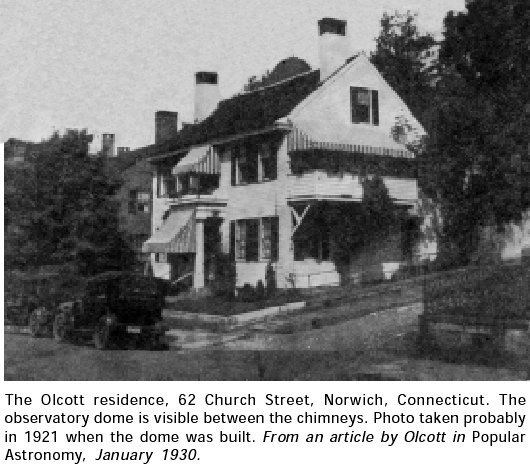 Walking up Schoolhouse Lane, it is possible to imagine the observatory Mr. Olcott had between the chimneys.